These web-pages have been scanned and converted from a photocopy of the "Focal Press" publication "Retina Reflex Guide", 1970 edition. There may be reference to "current" and "discontinued" models. Obviously all Retina cameras are now long discontinued, but For ease of editing if nothing else, all the original text has been retained. The Retina Reflex is an eye-level 35 mm. reflex camera with interchangeable lenses for all general photography as well as technical work, copying, photomicrography, stereo photography, etc. In many of these fields the ground-glass screen is a distinct advantage. The camera takes normal 35 mm. perforated film and produces a negative size 24x36 mm. (1 x 1� in.). The viewing system consists of a 45-degree mirror which throws the image formed by the lens on to a ground glass screen on top of the camera. A pentaprism permits observation of this image -- which appears upright and the right way round -- at eye-level. The centre of the focusing screen is taken up by a pair of crossed wedges which are set in the screen and act as a split image rangefinder. For the exposure the mirror swings out of the way together with a light-tight capping plate in front of the film aperture, thus leaving the way free for the lens to form its image on the film. This image exactly corresponds in sharpness and field to the screen image which is absolutely free from parallax irrespective of the lens used. In order to permit observation of the image, the shutter is open while the mirror is in the viewing position. On pressing the release the shutter closes while the mirror and capping plate fold away, and then opens and closes again to take the picture. The mirror and capping plate are also linked to the transport mechanism. This is operated by a rapid winding lever. In addition to advancing the film, the rapid winding lever closes the capping plate, brings down the mirror into the viewing position, advances the film counter, and tensions and opens the shutter for viewing. The film transport acts directly on the sprocket which pulls the film through the camera, and is also linked to the friction-driven take-up spool. Two types of lens system are available. On the Retina Reflex III, IV and S the whole lens is mounted interchangeably in front of the shutter. Each lens has an automatic depth of field indicator. On the earlier Retina Reflex the front unit is interchangeable and can be changed for a wide-angle or telephoto unit, while the rear component is firmly mounted behind the shutter blades. The shutter is a Synchro-Compur with coupled aperture and speed settings. It is MX-synchronized with built-in self-timer; the synchronizing lever can only be adjusted after releasing a safety lock. A photo-electric exposure meter is built into the body at the right-hand (transport) end of the camera. A diffusing disc is available to fit over the cell for incident light readings. The camera back is hinged at one end; a special safety device prevents accidental opening. The pressure plate does not press the film directly against the track, but leaves a very thin channel for the film. The Retina Reflex will accept most of the accessories made for the Retina IIS to IIIC cameras. The lenses of the Retina Reflex III, IV and S are interchangeable with the Retina III S lenses; those of the earlier Reflex are interchangeable with Retina IIC to IIIC lens units. 5. The shutter is tensioned and opens for viewing and focusing. In fact, some of these functions take place more or less simultaneously. On pressing the release button a number of operations take place immediately preceding the actual exposure. 5. The shutter opens again and closes to expose the film. This complete sequence takes a little over 1/50 second. The Retina Reflex camera was first introduced in 1957. The original model has a built-in photoelectric meter with exposure values, the lens front is interchangeable to accept tele and wide-angle front elements. In 1959 the Retina Reflex S appeared with the photoelectric exposure meter coupled to the aperture-shutter speed setting and interchangeable lens mount to accept telephoto and wide-angle lenses. 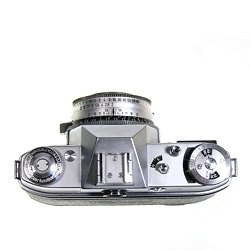 The Retina Reflex III of 1961 has the exposure meter indicator visible in the reflex finder and extra large viewfinder eyepiece and a release key on the camera front with safety lock. The Retina Reflex IV of 1964 has, in addition to the exposure meter indicator in the reflex finder of the Model III, aperture and shutter speed values shown in a window in the finder, a red warning signal when taking pictures in extreme lighting conditions and a fresnel screen for greater brightness. The split image rangefinder is placed diagonally. The standard lens focuses down to 23� in. (60 cm.). In addition to the flash socket there is also a direct flash connection in the accessory shoe. The rewind knob is fitted with a fold-over crank. The film counter is automatically reset on opening the camera back. In order to simplify the description and handling of the Retina Reflex camera without being confused by different features of individual models, this guide has been divided into a general section which applies to all Retina Reflex models while the requirements and consequently different handling of each model are found on the green pages. It is obvious that the camera should be held as steady as possible, as the slightest shake, even if not seen in the negative, will become visible in an enlargement. Always stand with your legs apart. FOR HORIZONTAL PHOTOGRAPHS grip the camera with your right hand with the index finger on the release and the thumb against the camera back. Thumb and index finger of the left hand move the focusing mount while the camera body rests on the middle finger and ball of the left hand for additional support. Keep the elbows pressed against the body. Either the right or the left eye may be used for the finder. FOR VERTICAL PHOTOGRAPHS turn the camera through 90° so that in the same basic holding position as for horizontal photographs -- your right hand grips the top. You can vary this standard hold, of course, to suit your own convenience. By some experimenting, you will find the grip which suits you best, and enables you to hold the camera really steady. To release the shutter, press the release with the ball of the finger. Use finger pressure only, and keep the hand and its grip on the camera steady. The actual pressing down will have to be done slowly and smoothly. The slower the exposure time, the smoother must be the release. For slow exposures in the hand it is advisable to rest the elbows, or at least to lean the body, against some support in order to avoid shake. In this way 1/15, 1/8 and 1/4 and even 1/2 sec. can be risked without incurring camera shake. Such a support is also desirable for faster exposures, as several movements take place inside the camera after pressing the release button. A slightly unsteady hold may thus easily lead to blurred pictures. For the same reason, keep the camera steady for a moment after pressing the button; do not jerk it away from the eye straight away, as the shutter opens about 1/50 sec. after pressing. The use of a tripod is necessary when taking time exposures and it is also recommended for speeds from 1/15 to 1 sec. For upright photographs from the tripod use a ball and socket head to allow changing from the horizontal to the vertical position. To be ready for quick action it is best to carry the camera on a short strap round the neck so that it lies on your chest. Lifting it up to the eye is then a matter of a split second. For convenience and protection the Retina Reflex should always be carried in its ever-ready case. This case is designed to hold the camera ready for use. A camera retaining screw fixed to the case screws into the tripod bush to hold the camera securely in the case even when open. The elastic clip inside the top of the case is intended to hold the incident light diffuser of the exposure meter. For horizontal shots hold the camera firmly with the right hand, with the index finger resting lightly on the release key. The second and third fingers of the left hand can be used to turn the focusing ring. For upright shots turn the camera through 90° so that it is supported from below with the left hand. The hol for the Retina Reflex S and earlier models is slightly different since the release button is on top of the body. Below: With the Retina Reflex models it is specially important to keep the camera really steady during the exposure and for a fraction of a second after pressing the release button. Support your body against something solid (a tree, or wall) whenever possible or prop up your arms on some suitable support (a fence or railing, or even against your knees). Time exposures should always be taken with a camera mounted on a tripod, using a cable release to release the shutter. This screws into the socket underneath the release key, or into the release button of earlier models. The image reflected by the lens on to the screen is only visible after winding the shutter. It disappears once the shutter is released. This indicates at the same time whether the camera is ready for the next exposure, as winding the shutter also advances the film. The reflex image is large and brilliant and appears almost in natural size; it is free from parallax. A viewing pentaprism shows the image upright and right-way-round at eye-level. The centre of the reflex finder image contains a clear circle. This centre circle is cut in half by a horizontal line and acts as a split image rangefinder. The distance to the subject can be measured in two ways. First, by observing through the centre circle of the reflex finder a vertical line of the subject to be focused e.g., a tree, edge of a wall, outline of a person and suchlike. On turning the camera focusing mount (the serrated ring on the lens mount nearest to the camera body) the image in the upper half moves in relation to the lower half of the circle. The lens is focused correctly when the two halves are exactly in line with each other. If the camera is held vertically, choose a horizontal line of the subject; the centre appears split vertically, otherwise the procedure is the same as described above. Alternatively, and particularly if the subject does not show any prominent vertical or horizontal lines, observe the image on the ground glass which surrounds the circle. Turn the lens mount until the image of the subject appears perfectly sharp on the ground glass. Whilst focusing with the split image rangefinder is quite straightforward, some experience is required to obtain the best definition quickly when using the ground glass method. The best way to arrive at critical definition is to turn the focusing ring of the lens mount slowly to and fro while observing on the ground glass the subject to be focused. As you turn the focusing mount, the image becomes more and more sharp up to a certain point, beyond which it will again lose definition. At this "beyond" stage, turn the mount back again, narrowing down the degree of movement until you arrive at the point of best definition. The orthodox way of focusing with either split field range-finder or ground glass may be adopted for taking photographs of subjects that are fairly stationary. A different method of focusing is required when taking subjects in motion. Set the rangefinder to a distance at which the subject will be in a given moment, or focus at some spot which it actually has to pass, and press the release button when the subject is reaching the pre-focused point. With subjects liable to react self-consciously (e.g., children) set the lens to a suitable distance, and then approach the subject quickly, exposing as soon as the ground glass image appears sharp, or the two halves of the rangefinder are in line with each other. Alternatively, focus at some object which is at the same distance from the camera as the subject, but in a different direction, and when the range is found swing round to press the release button as soon as the victim slips into the field of view of the finder. See also quick shooting with zone focusing (p.41). The Retina Reflex is a single lens reflex camera with (on the current model) fully interchangeable lenses. The section through the camera (above) shows the main components of the optical system. The heavy arrowed line indicates the path of the light from the lens to the finder. The centre of the screen of the Retina Reflex carries a split image optical rangefinder which shows the incorrectly focused subject in two displaced halves (right. The remainder of the finder field constitutes a ground glass focusing screen. When the subject is accurately focused, it appears sharp on the screen and the two halves of the rangefinder image move together to form a continuous line (above and extreme right). Work the film transport. Swing film transport lever out as far as it will go (180°). It will only spring back into its original position if it has been wound fully. This advances the film and film counter, tensions the shutter, opens up the aperture and brings down the mirror, ready for the next exposure. Set the exposure. Adjust the shutter for the right amount of light for the subject conditions. The built-in photo-electric exposure meter indicates the setting required, or even sets the controls. Select the aperture speed combination you want to use, smaller aperture for greater depth of field (p. 40) or faster speed to arrest movement (p.38). The Retina Reflex uses standard perforated cine film, 35 mm. wide, as used in the majority of other 35 mm. miniature cameras. It is available in various packings (see also p. 18), the most convenient being standard daylight cassettes. These are light-tight containers with a ready cut and trimmed length of film for 36 or 20 exposures and are loaded into the camera in daylight. Open the camera back by turning the double lever surrounding the tripod bush on the camera base in the direction of the arrow. Then press the little button underneath the lever, and the back will spring open. Fully pull out the rewind knob above the film chamber. Insert the film cassette so that projecting spool peg lies in the recess in the bottom of the spool chamber. Push back the rewind knob. Fix the film to the take-up spool. Pull out about 3� in. of film from the cassette; turn the built-in take-up spool so that the slot is accessible. Push the film end into the slot and anchor a perforation hole in the hook of the slot. Turn the take-up spool to take up the film slack. It should lie flat across the film aperture, and the "teeth" of the sprocket wheel engage the lower row of perforations. Not less than two of the upper perforations should overlap the film track. Close the back by pressing the back against the body until the catch engages. Set the film indicator. The film indicator on top of the rewind knob is marked with various types of films available. Grip the rewind knob with two fingers and turn the inner serrated ring with your fingertip until the triangular index mark points to the type or speed of film loaded. This is to aid your memory. It has no influence on the exposure or working of the camera. Top left: Open the camera back. Top centre:Pull out the rewind knob (on Reflex S and original models) to its second stop. Top right: Insert the cassette with film into the empty chamber. Centre left: Push back the rewind knob into its normal position. Centre: Thread the film into the slit of the take-up spool. Centre right: Close the camera back. Bottom left: Set the film counter according to the number of frames of film in use. Bottom right: Set the film speed on the exposure meter. After all exposures have been made, the camera has to be unloaded. The exposure counter window should, at this stage, indicate 0. The film transport lever locks after you have made the last exposure on your film. Depress the reversing button in the base of the camera situated in the curve of the film transport lever. Rewind the film. Turn the rewind knob in the direction of the engraved arrow (clockwise) until the reversing button ceases to rotate. This button carries a black dot near its edge for easy observation of movement. Open the camera back as for loading (p.13). Remove the cassette after pulling up the rewind knob. Close the camera back or reload with a new film. Top left: Press down the rewind button in the base of the camera. Top centre: Rewind the film. Top right: Open the camera back. Bottom left: Pull out the rewind knob fully and take out the cassette. Bottom right: Close the camera back or reload with a new film. If a film which is only partly exposed has to be processed, it can be cut off in the darkroom or in complete darkness. After the last exposure wind on the film transport once more, open the camera back in the darkroom, and cut the film about � in. away from the cassette. The exposed part on the take-up spool is removed by winding the film from the take-up spool and wrapping it up in three pieces of black opaque paper. The remaining film in the cassette can now be re-inserted on the take-up spool and the camera closed. If the re-inserting has been done in the darkroom no further blind exposure is necessary; if the film has been re-inserted in daylight, two blind exposures should be made and the film counter should be advanced by two divisions. Note that short lengths of some makes of colour reversal film will not be accepted for processing. Rewind the film but stop immediately you feel a slight resistance. This resistance comes from pulling the film end from the take-up spool. If the film is to be reloaded again, you must not pull the whole film into the cassette, otherwise the film end would have to be extracted by opening the cassette in the darkroom for subsequent re-insertion into the camera. Unload the re-wound film and note the number of exposures taken on the beginning of the film. Now you can load the camera with any other type of film. WHEN RELOADING, load the partly-exposed film in the same way as a new one. Push the film counter setting button (model III only) in the direction of the arrow, and hold it there. Wind the transport lever until the film counter has advanced by the number of frames already exposed. On earlier models press the film release button every time. To be on the safe side it is advisable to allow one more frame to pass. The film release (not on Model IV) helps in rectifying any jamming which may lock the mechanism of the rapid winder. Pushing the film counter-setting button in the direction of the arrow (on earlier models : pressing the film release button next to the shutter release) clears the winder, without losing a frame or risking a double exposure. If the film release does not release the winder, this automatically indicates that the end of the film has been reached. Similarly, if you did not set the film counter when loading you may reach No. 1 on the film counter before the end of the film is reached. At No.1 the rapid winding lever automatically locks. By working the film release you can re-set the exposure counter, which at the same time will free the winding lever. Should the winding lever stick in an in-between position, work the film release to make it spring back. The double-exposure lock of the Retina Reflex prevents accidental double exposures. To make a deliberate double exposure for special purposes, press the reversing button after the first exposure, and keep it depressed while tensioning the shutter with the rapid winding lever. The film then remains in position for a second exposure on the same frame. Note that operating the rapid winder after the second exposure also advances the film counter to indicate one frame more than the number exposed. In addition to standard cassettes, 35 mm. black-and-white film is available in loose packings for loading into cassettes. This is a much cheaper way of using film as you do not have to buy a new cassette every time with the film. The following packings are available. 1: The correct trimming of the wedge-shaped end (which is fitted to the centre spool of the cassette) with a standard trimming template. 2: Trimming of the curved cut with a standard trimming template. 3: The appearance of the trimmed film: left, wedge; right, curved cut. 4: The film cassette, its outer shell, centre spool and separate top. 5: How to fix the film to the centre spool of the cassette with a piece of adhesive tape. 6: Winding the film with the mechanical film winder to the centre spool. 7. Assembling the cassette 8. Loading the film into the camera. When using bulk film in loading cassettes, the edge of the work-bench can be marked with notches or drawing-pins to indicate various distances, let us say for 12, 24, 36 exposures of film. This considerably simplifies the measuring of film lengths in the darkroom. Work in total darkness and prepare the film as described (p. 18). Wind the mm on the centre spool. Cut off the paper-leader. Where top and bottom are originally fastened by the outside label, fix the top or bottom cover to the shell, preferably with a length of cellulose tape. There are two kinds of films available for the Retina Reflex : black-and-white and colour. SLOW FILMS are of low sensitivity, requiring comparatively great exposure. Their main advantage is the extremely fine grain, permitting a high degree of enlargement without its granular structure becoming unpleasantly visible. Such films also yield images of the greatest sharpness. On the other hand, these slow films are not very suitable for coping with fast movement in other than exceptionally good lighting, nor for general work in poor light. Such films are rated at 40-80 ASA or l7-20° DIN. MEDIUM SPEED FILMS still yield a reasonably fine grain with good gradation. They are the most suitable material for all-round photography, other than in poor light. These films are rated at 100-l60 ASA or 21-24° DIN. FAST FILMS with somewhat coarser grain (still acceptable for reasonable degrees of enlargement) will cope with most light conditions including poor light and interiors in favourable conditions. This is the right film for the photographer who wants to be prepared for the unusual, to arrest fast movement with high shutter speeds, as well as shots in poor light. The speeds are 200-400 ASA or 24-27° DIN. ULTRA FAST FILMS are primarily intended for high-speed sports shots in dull weather, interior snapshots in poor light, night photography and ill-lit stage pictures. These films are specialist types for conditions where normal materials are totally inadequate. They should not be used for general photography. The high speed is achieved at some cost in definition and graininess. Speed ratings range from 500 ASA or 28° DIN upwards. The above speed figures are based on the latest ASA Standard for film speeds (and on the BS and DIN Standards under revision). These figures, when used on the exposure meter, give minimum correct exposures, to make the most of the versatility of the film and of the image quality. They are also the figures quoted by most film manufacturers. Sometimes films are, however, still rated according to earlier standards which in effect incorporated a generous safety factor against under-exposure -- by the simple process of over-exposing films about 100 per cent. (well within the exposure latitude of most black-and-white films). So you may come across films apparently only half as fast as others of similar type, because of this difference in ratings. The table on p 69 indicates the current film speeds to he used with the exposure meter, even if the film packing gives a lower rating. This applies to black-and-white negative materials only; speed rating methods have not changed for colour films. FILM SPEED, CONTRAST, GRAIN, RESOLVING POWER. (a) daylight colour film, which will give correct colour reproduction in daylight or with blue-tinted flash bulbs or electronic flash. The majority of colour films, reversal and negative, are rated between 25 and 64 ASA or 15 and 19 DIN, which corresponds to a fairly slow speed for black-and-white material. A few films go up to 160 ASA or more for poor light conditions. Others may be as slow as 10 ASA or 11 DIN. As with black-and-white films, the slower types tend to yield improved image detail, especially with negative colour film, while the fastest emulsions may show slightly reduced colour saturation and image sharpness. The commonest example is the blue sky with white clouds in a landscape. The blue is so brilliant (and the film is often excessively sensitive to it) that the clouds do not show up against it. By putting a yellow filter in front of the camera lens we can subdue or "hold back" the blue, so making it record darker in the final print. We can even go further and over-emphasize the effect progressively with an orange or red filter; these darken the blue so much that the sky looks almost black for a really dramatic effect. There are times when the judicious use of reflections will enhance the pictorial effect of the picture, but they are also frequently obtrusive and undesirable. Thus highly-polished subjects are difficult to illuminate successfully so as to obtain a true photographic rendering, since they will reflect too much light and so spoil the reproduction with a glare which obscures the detail. To overcome this difficulty the polarizing filter suppresses light reflections from glass, china, enamel, polished wooden surfaces, water, etc. (but not metals.) This filter will prove particularly useful when taking shop windows, furniture, photography of wet objects, etc. The effect is greatest when the camera points at a reflecting surface at an angle of about 35°. The filter must be rotated to find out its best position on the lens. The Retina Reflex camera is ideal for this observation. The filter is simply held in front of the lens, and then slowly rotated to find the best or desired result on the reflex-focusing screen. Push the filter on to the lens in the position selected. As the polarizing filter is slightly tinted, the exposure time should be increased by a factor of 3. The aperture number or f-stop controls the amount of light allowed to enter through the lens. These numbers run in a series: 2-2.8-4-5.6-8-11-16-22. Each higher stop number lets through half the light of the next lower number (next larger stop). With exposure meters built into the camera and coupled to cross-linked aperture-speed controls you may even be able to set the right exposure without looking up the number either on the meter or the camera. You set the exposure visually by following the swing of the needle in the meter and matching it with a pointer or a circle on the spot where the needle comes to rest. If there is fast action you have to choose and pre-set an appropriately fast shutter speed (p.38) and then pair it with the stop you get by the cross-coupled controls or from your meter. If the scene is to be sharp from a point close to the lens to some other point well away from it, you should choose the stop that will yield the necessary depth of field (p.40) and then pair it with the shutter speed necessary for the correct exposure. Exposure nowadays is no problem at all. You can arrive at the right exposure by guessing it, measuring it, or just leaving it to the camera. But to hit it off in such a way that it will produce the picture you want is still a matter of intelligent judgement. It is safest to release the shutter with the help of a cable release to avoid shaking the camera. This release screws into the bush in the centre of the body release button. The Retina Reflex models carry a delayed action release or self-timer. This is usually controlled by the same lever as the flash synchronization (p.42). When you press the release button with the self-timer in operation, the shutter only goes off after a delay of 8-10 seconds and you have time to take your place in your own picture. The camera must, of course, be mounted on a tripod. For normal meter readings. point the camera with the cell at the subject by observing the latter on the finder screen. With landscapes and other open views point the camera slightly downwards to exclude excessively bright sky areas which might give misleading results. For accurate readings against very light or very dark backgrounds, go close to the subject with the camera so that the meter cell just takes in the important part of subject. Subjects of great contrast with very bright as well as very dark areas call for separate close-up readings. Here you measure the light first of the bright and then of the dark parts independently, noting the apertures obtained in each case, and finally set the aperture scale (with the exposure wheel) to an in-between value. The meter needle will of course in this case no longer be lined up with its setting index. Incident light readings are most reliable for colour film, and have the advantage that they need very little correction for the subject itself. To take such readings first fit the diffusing screen supplied with the camera over the exposure meter cell. Then point the camera with the meter from the subject towards the camera position to be used for the exposure. So there is more to using a meter than just pointing it at the subject and accepting the reading without question. INCIDENT LIGHT MEASUREMENT. Another method of assessing exposure is to measure the strength of the light falling on the subject instead of that reflected by it. But if you point the meter straight at the light you get a much higher reading than if you point it at the subject. So the light has to be cut down for the meter to indicate the correct exposure. This is done by fitting a white diffuser supplied with the meter over the honeycomb cell. The diffuser is designed to reduce the light by just the right amount. It also serves another important purpose, and this is to ensure that the meter includes all the light falling on the subject over an angle of almost a full 180°. An unsteady camera hold results in camera shake, to which a small and light instrument such as the Retina Reflex is particularly liable. Even the slightest shake will result in inferior definition of the negative. Practical experience goes to show that 1/125 sec. is safe, while you have to hold the camera particularly steady when using 1/60 or 1/30 sec. Where lighting conditions make even longer exposure times essential and there is no subject movement, either support the camera on a tripod, or look round for extra support for your elbows and hands -- e.g. a wall, railing, etc. The most convenient way of allowing for all these factors with the aid of a simple table (p. 65). When you focus the Retina Reflex on a given object, the image of that object will be really sharp on the film. Things nearer or farther away will be gradually less and less sharp, until they are noticeably blurred. The range of distances over which objects are still acceptably sharp, before you do notice the loss of definition, is known as the depth of field. You can obtain the actual zone of sharpness at various apertures and distances from depth tables but in practice the most convenient way is to use the depth of field indicator. On the Retina Reflex IV, III and S this consists of two red pointers above the distance scale of each lens coupled to the aperture setting. The pointers automatically close up at large apertures and move apart at small apertures. One pointer indicates the near, the other the far limit of the depth of field for the distance and aperture the camera has been set to. For example, at 9 ft. and f2.8, you will find the two pointers opposite 8 and 10 ft. so you have a sharp zone from 8 to 10 ft. At f16 the distances opposite the pointers may be 5� and 25 ft. respectively. The original Retina Reflex has a special scale of aperture numbers marked opposite the distance scale. There are two sets of such numbers from the largest stop (f2.8 or f1.9) to the smallest (f22)on each side of the focusing index (the mark that indicates the distance to which you have set the lens). You will also notice that the depth of field is greater at far distances than near ones. At 5 ft. and f2.8 the sharp zone covers from 4� ft. to 5� ft. -- less than 1 ft. all together -- against 2 ft. at the 9 ft. setting and some 15-20 ft. at 25 ft.
First, the depth obtained depends also on the focal length of the lens. Short focus lenses yield more depth and tele lenses less depth. That is why the alternative lens units of the Retina Reflex have their own depth of field indicator. Secondly, the sharp zones obtained by the indicator are based on a somewhat arbitrary assumption of how much blurring is acceptable. So depth of field data for different cameras with the same lens may not always agree, and you are also quite safe in rounding off figures obtained from such data. And if you intend to make realty big enlargements from your negatives, you can use stricter standards of sharpness by simply stopping down the lens by one stop. The depth of field scale shows clearly how much of the subject will be sharp at any given distance and aperture. The figure opposite the triangular index mark (top) is the focused distance (8 ft). The figures to either side of the index mark represent aperture settings. If we then read off the distance opposite the aperture settings, we see indicated the area of sharp focus. So with an aperture of f16 this area extends from just under 5 ft. to about 50 ft. But at f4 the depth of field is more limited, from just over 5 ft. to about 10 ft.
On the Retina Reflex S and III two pointers automatically show the depth of field zone (bottom). The pointers are coupled with the aperture control and move apart at small stop settings and together at large apertures. With action subjects and similar occasions where you want to shoot quickly, determining sharp zones even with the depth of field indicator wastes too much time. There you need prepared settings covering given near and medium distance ranges that you can easily memorize and set on the camera. The focusing zone table (p.49) gives such settings : then you only have to worry about keeping the subject within that zone while you shoot. The flash bulb is inserted in a flash gun and the current of the battery fires the bulb, while a reflector fixed behind the bulb makes sure that all the light is directed towards the subject. Most flash guns incorporate a capacitor unit which increases the reliability of firing, even when the battery is nearly exhausted. The shutter speed, provided it is slower than 1/30 sec. (1/60 sec. with smaller bulbs), has no effect on exposure, since the flash is shorter than the exposure time. Above: The synchronizing settings showing also the synchronizing locking lever (top left) and the flash socket on the camera front which accepts the flash gun lead (top centre and right). At the M setting, flash bulbs can be synchronized with any shutter speed from 1 to 1/500 sec. (lower left). At the X setting, electronic flash will synchronize at any speed from 1 to 1/500 sec.. but flash bulbs only to 1/30 sec. (lower centre). The V setting controls the delayed-action release and synchronizes in the same way as the X setting (lower right). Right: More natural-looking lighting results from "bouncing" flash light from a light surface (i.e., a ceiling) For ease of operation, the flash gun can be fitted into a shoe on a movable ball which itself fits into the camera accessory shoe. Left: The Kodablitz flash gun for the Retina Reflex uses a capacitor unit and a 22.5-volt miniature battery. The gun will fit either into the accessory shoe on the camera, or on to a bracket which is screwed into the tripod bush. The Retina Reflex shutter is internally synchronized for use with flash bulbs and electronic flash. The cable from the flash gun is plugged into the flash socket of the camera. On releasing the shutter, an electric circuit is automatically closed through the flash socket, setting off the flash at this moment. A synchronizing lever protrudes on the side of the shutter.This can be set to X or M.
The Retina Reflex IV has no synchronization lever. Its shutter is X-synchronized only. Therefore the information on M-synchronization below does not apply to this model. The field of view covered by the standard lens is ideal for the majority of subjects. Occasionally, however, a greater or reduced field of view has distinct advantages. Most Retina Reflex models have an interchangeable lens system providing alternative focal lengths for such occasions. Using a wide-angle or telephoto lens focusing is not different from that of the standard lens. The Retina Reflex screen enables the image to be focused accurately by means of the split image rangefinder or on the ground area. At the same time, the reflex screen shows the exact field of view of the particular lens used. There is no parallax error. THE RETINA REFLEX IV camera is fitted with either the four-element Retina Xenar f2.8 50 mm. or the six-element Retina Xenon f1.9 50 mm. Both have an angle of view of 47° and permit focusing from infinity to 24 in. (60 cm.). The complete lens is interchangeable against wide-angle and tele-photo lenses. The built-in photo-electric exposure meter is directly coupled to the aperture setting. The meter needle is set in the viewfinder without taking the camera from the eye. The exposure meter needle is also visible in a window on top of the camera. A red signal appears in the viewfinder when there is insufficient light to take the picture. The shutter speed and aperture are reflected into the viewfinder. The reflex screen has a fresnel lens, yielding a brighter image. The split image rangefinder has a diagonal cutting line for easy vertical and horizontal focusing. The built-in Synchro-Compur shutter has cross-coupled shutter speed and aperture settings and is X flash synchronized with direct flash contact in accessory shoe and flash contact on camera body. The exposure counter is self-zeroing and the rewind knob is fitted with a foldover hand crank. The f2.8 lenses accept 32 mm. screw-in filters and close-up lenses (32 mm. is the outside diameter). The lens hood is rectangular with a tubular bayonet fitting on the back to fit the bayonet mount surrounding the lens itself. The f1.9 lenses accept filters and close-up lenses of 60 mm. diameter. No lens hood is ordinarily required as the lens is deeply recessed in its mount. OTHER ACCESSORIES include a close-up attachment, table stand, copying stand, 1:1 close-up stand, microscope adaptor, and framefinder. The film speeds are set on the film speed dial with the aid of the locking knob on the back of the camera and the exposure wheel. The meter needle is visible in the needle window on top of the cameras well as in the viewfinder. A lens setting reflector above the lens also shows apertures and shutter speeds in the viewfinder. The rewind knob is fitted with a rewind crank. An automatic depth-of-field indicator is coupled with the aperture control. Aperture and shutter scales are cross-coupled and are also coupled with the meter needle via the exposure wheel. The winding lever is on the base of the camera with the rewind button situated beside it. The film counter is also in the base and is reset with the counter setting button. Shooting with the Retina Reflex IV. From left to right: work the winding lever; turn the exposure wheel to centre the meter needle between the two fixed prongs in the finder field; select the most suitable aperture-speed combination; focus the image in the finder; press the shutter release to expose. Open the camera back . Pull out the rewind knob . Insert the film cassette . Push back the rewind knob . Pull out 3� in. of film . Fix the film to the take-up spool . The exposure counter is self-setting . Transport film and release until the counter shows to 36. If films with 20 or 12 exposures are used, push the exposure-counter button beside the counter window until the diamond mark points to 23 or 15 in the counter window and only then transport film and release until the counter points to 20 or 12 respectively. Set film speed by pushing upwards the small locking knob on the back of the camera below the speed indicator window while at the same time turning the exposure setting wheel below the lens mount until the required film speed in ASA or DIN appears opposite the cut-out in the film speed window. Rewind film after folding over crank in rewind knob; the knob automatically rises slightly. Set the exposure time before taking a reading with the coupled meter (below). The shutter speed ring bears two sets of figures separated by the letter B. The figures to the right of B denote fractions of a second (e.g. 30 = 1/30 sec.) Turn the ring until the required speed is opposite the arrow head; usually 1/60 sec. is a convenient starting point. Look through the finder. Take care not to get your fingers in front of the honeycomb cell of the meter. Turn the exposure setting wheel below the lens mount until the meter needle is centred between the heavy double lines to the left of the viewfinder field. This sets the correct aperture for the pre-selected shutter speed. You can also watch the meter needle in the window in the top of the camera. This is useful if the depth of field obtained should be observed at the same time. Point the camera at the subject, and turn the setting wheel until the needle is centred between the two markers. The correct aperture is now set for the pre-selected shutter speed. A resistance while you turn the setting wheel indicates that you have reached the limits of the aperture scale. If you turn on, you then also change the shutter speed to obtain a correct exposure setting. Select the aperture-speed combination. If you should want a different shutter speed or aperture after having set the correct exposure, turn the shutter speed ring by its two black finger holds, until the appropriate combination is opposite the arrow head. Aperture and shutter speed rings move in opposite directions, and only the figures actually opposite the arrow head indicate the correct combination. To set apertures and speeds separately (e.g. for flash shots) adjust first the shutter speed and then the aperture (by the exposure setting wheel). Focus. Look through the viewfinder and turn the lens mount by the protruding knob on the front until the image is sharp in the finder. On some of the lenses you move the milled focusing ring. Release the shutter gently by pressing the key on the camera front. FOR TIME EXPOSURES turn the shutter setting ring to bring the letter B (=brief time) opposite the arrow head. On pressing the release, the shutter will remain open as long as the release is pressed down, and closes as soon as the pressure on the released is removed. The green figures on the exposure scale are time exposures. They indicate the time in seconds for which the release has to be depressed at some of the smaller apertures at low lighting levels. If, for example, an exposure setting gives 1 sec. at f2.8 any of the following combinations may be used: 4 sec. at f5.6; 8 sec. at f8; 15 sec. at f11; or 30 sec. at f16. Incidentally, there is no green number 2. Its place is taken up by B. When reading off full seconds, read 2 seconds for the B position. In the example above, if you want to use f4, you would require 2 seconds. THE DELAYED-ACTION RELEASE for self-portraits, built into the shutter, is brought into action by moving upwards the green lever on the shutter beside the release key. On pressing the release button with the lever set to "V", the shutter goes off after a delay of approximately 10 sec., giving the operator time to take his place in the picture. Once the lever has been set to "V", it cannot be moved again. On releasing, the lever will automatically spring back into the original position. FLASH. The Retina Reflex IV has a fixed X flash synchronization. Therefore only those instructions on page 60 referring to X-synchronization apply. THE RETINA REFLEX III is fitted with a 2-in. (50 mm.) Retina Xenar or Retina-Ysarex f2.8 or a 2 in. (50 mm.) Retina-Xenon or Retina-Heligon f1.9. The f2.8 lenses are four-element triplets, the f1.9 lenses have six elements of symmetrical four-component design. All have an angle of view of 47° and permit focusing from infinity down to 3 ft. The extra-large eyepiece of the finder shows the entire picture on the ground glass screen even when wearing spectacles or sunglasses. A release key with safety button prevents unintentional exposures. The handy location of the key ensures particularly smooth release. The built-in Synchro-Compur shutter has cross-coupled shutter speed and aperture settings. The f2.8 lenses accept 32 mm. screw-in filters and close-up lenses. (32 mm. is the outside diameter). The lens hood is rectangular with a tubular bayonet fitting on the back to fit the bayonet mount surrounding the lens itself. The film speeds on the film speed dial are set with the aid of the speed button and the exposure wheel. The meter needle is visible in the needle window on top of the camera, as well as through the viewfinder. The rewind knob incorporates a fllm-type indicator. The focusing knob moves the lens forward and backwards and is attached to the front mount with the distance scale. An automatic depth of field indicator is coupled with the aperture control. The aperture and shutter speed scales are cross-coupled with each other, as well as being coupled with the meter needle via the exposure wheel. The film counter in the camera base counts exposures backwards, and can be reset by the counter setting button. The transport lever in the camera base advances the film and film counter, and also actuates the other operations of the winding sequence. Shooting with the Retina Reflex III. From left to right: Work the rapid winding lever; turn the exposure wheel to centre the meter needle between the two fixed prongs in the finder field; select the most suitable aperture-speed combination; focus the image in the finder; press the release key to expose. Pull out the rewind knob. Pull out 3�# in.of film. Fix the film to the take-up spool. Set the mm counter by pushing the film counter setting button in the base of the camera (between transport lever and counter window) repeatedly in the direction of the arrow, until the diamond mark between 36 and 1 in the counter window is opposite the cut-out on the rim. If a 20 exposure film is used, set the diamond mark next to 23 to the cut-out. Pull out the rapid winding lever as far as it will go and let it fly back. Release the shutter. Repeat this until No.36 (or No.20 for a 20 exposure film) appears opposite the cut-out of the film counter. Set the film speed on the exposure meter. Depress the button on the camera top between the film speed dial and needle window. On later models, push up the knob on the back of the camera below the speed indicator window. At the same time turn the exposure setting wheel below the lens mount until the required film speed in ASA or DIN appears opposite the cut-out in the film speed window. Set the exposure time before taking a reading with the coupled meter (below). The shutter speed ring bears two sets of figures separated by the letter B. The figures to the right of B denote fractions of a second (e.g. 30=1/30 sec.). Turn the ring until the required speed is opposite the arrow head; usually 1/60 sec. is a convenient starting-point. Release the shutter gently by pressing the key on the camera front. The release will only move if you press down the black safety catch at the same time. FOR TIME EXPOSURES turn the shutter setting ring to bring the letter B (=brief time) opposite the arrow head. On pressing the release, the shutter will remain open as long as the release is pressed down, and closes as soon as the pressure on the release is removed. The green figures on the exposure scale are time exposures. They indicate the time in seconds for which the release has to be depressed at some of the smaller apertures at low lighting levels. If, for example, an exposure setting gives 1 sec. at f2.8, any of the following combinations may be used: 4 sec. at f5.6; 8 sec. at f8; 15 sec. at f11; or 30 sec. at f16. Incidentally, there is no green number 2. Its place is taken up by B. When reading off full seconds, read 2 seconds for the B position. In the example above, if you want to use f4, you would require 2 seconds. THE DELAYED-ACTION RELEASE for self-portraits, built into the shutter, is brought into action by moving the lever on the right of the shutter (looking down from the top) to "V". This can only be done after the film has been advanced. First depress the small projecting stud next to the word "SYNCHRO" behind the shutter ring. On pressing the release button with the lever set to "V", the shutter goes off after a delay of approximately 10 sec., giving the operator time to take his place in the picture. Once the lever has been set to "V", the position cannot be altered any more. On releasing, the lever will automatically move back to the X position. FLASH SETTINGS. For X- or M-synchronization, set the lever at the right of the shutter to X or M, at the same time depressing the small protruding lock on the left. THE RETINA REFLEX S is fitted with a 2 in. (50 mm.) Retina Xenar or Retina-Ysarex f2.8 or the 2 in. (50 mm.) Retina-Xenon or Retina-Heligon f1.9. The f2.8 lenses are four-element triplets, the f1.9 lenses have six elements of symmetrical four-component design. All have an angle of view of 47° and permit focusing from infinity down to 3 ft. The complete lens is interchangeable against wide-angle and telephoto lenses. The built-in photo-electric exposure meter is directly coupled to the aperture setting, the meter setting is obtained by super-imposing a pointer with a needle, while observing the exposure meter window in the top of the camera. The f2.8 lenses accept 32 mm. screw-in filters and close-up lenses (32 mm. is the outside diameter). The lens hood is rectangular with a bayonet fitting on the back to fit the bayonet mount surrounding the lens itself. OTHER ACCESSORIES include close-up attachment, table stand, copying stand, 1:1 close-up stand, microscope adaptor, right-angle finder, and framefinder. The film speeds are set on the film speed dial of the exposure meter. The film counter in the camera top counts exposures backwards. The film release frees the film transport lock and permits advancing the film without exposing it (for example when changing partly exposed films). The release button in the camera top incorporates the cable release socket. The film counter setting button is mounted in the back of the camera. The rewind knob incorporates a film-type indicator. The automatic depth of field indicator is coupled with the aperture control. The shutter speed and aperture scales are cross-coupled with each other and are also coupled with the setting marker of the exposure meter via the exposure setting wheel. The focusing knob is attached to the focusing lens mount which carries a distance scale. The rapid winding lever advances the film and film counter as well as bringing the winding sequence into action The reversing button in the camera base disengages the film transport for rewinding the film. Shooting with the Retina Reflex S. From left to right: Advance the film and tension the shutter with the rapid winding lever; turn the exposure wheel to line up the setting marker with the meter needle; select a suitable aperture-speed combination; focus the image through the viewfinder; press the release to expose. THE RETINA REFLEX is fitted with a 2 in. (50 mm.) Retina-Xenon or Retina-Heligon f2. These lenses consist of six elements of a symmetrical four-component design and have an angle of view of 47°. They focus from infinity down to 2� ft. The front element is interchangeable and can be replaced by wide-angle or telephoto units, converting the whole lens into a wide-angle or telephoto system. The built-in photo-electric exposure meter works with a setting marker, which has to be set to the needle position and directly indicates exposure values. The built-in Synchro-Compur shutter is similarly calibrated for exposure values and has cross-coupled speed and apertures. The lens accepts 32 mm. screw-in filters and close-up lenses (32 mm. is the outside diameter). The lens hood is rectangular with a bayonet fitting on the back to fit the bayonet mount, surrounding the lens itself. OTHER ACCESSORIES include a close-up attachment, table stand, copying stand, microscope adaptor, stereo attachment, right-angle finder and frame-finder. The meter wheel controls the setting marker of the exposure meter and incorporates the film speed setting. The meter window shows the meter needle and setting marker. The film counter in the camera top counts exposures backwards. The film release disengages the transport lock for changing partly exposed films. The release button incorporates a cable release socket. The film counter setting button is mounted in the camera back. The rewind knob incorporates a film-type indicator. The shutter speed and aperture controls are cross-coupled, but not coupled with the exposure meter. The exposure value lever selects exposure values. The focusing ring carries the distance scale. The synchronizing lever selects X or M synchronization, and tensions the self-timer. The front lens component is interchangeable to yield alternative focal lengths. The rapid winding lever tensions the shutter, advances the film, and actuates the winding sequence. The lens catch releases the interchangeable lens component. The reversing button disengages the film transport mechanism. Shooting with the original Retina Reflex. From left to right: Work the rapid winding lever; set the exposure value; select an appropriate aperture speed combination; focus the image through the viewfinder; press the release to expose. Pull out 3� in. of film. Set the film counter by pushing the counter setting button at the right of the viewfinder in the direction of the engraved arrow, while at the same time pressing the film release button behind the exposure counting window. Keep pushing the setting button over until the diamond mark between the No.1 and 36 in the film counter is opposite the notch in the window. If a 20-exposure film is used, set the diamond mark between Nos. 20 and 25 to the notch. Now pull the transport lever as far as it will go and press the film release. Repeat until No.36 (or No.20 on a 20-exposure film) appears in the film counter. Set the film speed on the exposure meter. On the Retina Reflex S depress the button in the centre of the meter dial and turn the exposure setting wheel below the lens barrel to bring the required ASA or DIN figure into the appropriate cut-out of the meter dial. On the earlier Retina Reflex turn the inner disc of the exposure meter dial by the small stud near its circumference to bring the required film speed opposite the appropriate (ASA or DIN) arrow head. Rewind the film. On the early Retina Reflex pull up the rewind knob to its first stop for rewinding. Retina Reflex S: Set the exposure before taking a reading with the coupled meter. The shutter speed ring bears two sets of figures separated by the letter B. The figures to the right of B denote fractions of a second (e.g. 30=1/30 sec.). Turn the ring until the required speed is opposite the arrow head; usually 1/60 sec. is a convenient starting-point. Then point the camera at the subject and turn the exposure setting wheel below the lens barrel until the yellow pointer covers the white indicator needle of the meter. That sets the correct aperture for the pre-selected shutter speed. The white lines visible in the two corners of the meter window indicate the limits of the meter readings. If the white meter needle is outside these marks, the light conditions are too strong or too weak for the measuring range of the meter. Retina Reflex: Set the exposure value. The shutter rim carries a range of numbers engraved in red from 2-18 which represent exposure values for correct exposure. Each exposure value covers a range of shutter speed-aperture combinations as by a single setting. The built-in exposure meter of the Retina Reflex (see below) is calibrated in exposure values, the reading can thus be transferred directly to the shutter. To set the exposure value, slightly depress the serrated lever on the left of the shutter front and move the red dot beside it to the appropriate exposure value on the scale. Intermediate exposure values, e.g. 10�, 11�, etc., can also be set. Select the aperture-speed combination. If you want to change the shutter speed or aperture on the Retina Reflex S, turn the shutter speed ring by its two black finger holds, until the appropriate combination is opposite the arrow head. Aperture and shutter speed rings move in opposite directions, and only the figures actually opposite the arrow head indicate the correct combination. On the Retina Reflex, change the combination by turning the milled shutter ring. Aperture and speed scales here move together. The figures opposite each other represent alternative combinations corresponding to the exposure value set. Again only the aperture and speed actually opposite the double arrow head are the ones in use. To set apertures and speeds separately with both models (e.g. for flash shots) adjust first the shutter speed and then the aperture by turning the exposure setting wheel of the Reflex S, or by depressing the exposure value lever and turning the aperture ring on the Reflex. Focus. Look through the viewfinder and turn the front lens mount of the Retina Reflex S, or the large serrated ring on the back of the shutter rim of earlier Reflex models, until the image appears sharp in the finder. Release the shutter by gently pressing down the release button. Set the film speed as described for loading. Point the camera at the subject, taking care not to obscure the honey-comb meter window by a finger. Turn the meter setting ring to line up the yellow pointer with the white meter needle. The white needle moves in the cut-out window (between body release and exposure meter wheel). Turn the meter setting ring (the outer milled ring of the exposure meter knob) until the yellow pointer lies exactly over the top of the white needle. Read off the exposure value opposite the red triangle on the inner disc of the exposure meter knob. If the triangle points to a position between two numbers, set the intermediate light value. For example, if the triangle points between 8 and 9, use 8.5 for greatest accuracy. FOR TIME EXPOSURES turn the shutter setting ring until B (=brief time) is opposite the index mark. On releasing, the shutter will remain open as long as the release button is pressed down and closes as soon as the pressure on the release is removed. On the Retina Reflex S the green figures on the exposure scale are for calculating time exposures. With the shutter speed ring set to B, the green figures indicate the time in seconds required at smaller apertures and low lighting levels. If, for example, an exposure setting gives 1 sec. at f2.8, any of the following combinations may be used: 4 sec. at f5.6; 8 sec. at f8; 15 sec. at f11; or 30 sec. at f16. Incidentally, there is no green number 2. Its place is taken up by B. When reading off full seconds, read 2 seconds for the B position. In the example above, if you want to use f4, you would require 2 seconds. THE DELAYED-ACTION RELEASE for self-portraits built into the Synchro-Compur MXV shutter is brought into action by moving the lever on the left of the shutter (right on the Reflex S) to "V". This can only be done after the film has been advanced. To move the lever first depress the small projecting stud at the rear of the shutter ring (on the earlier Reflex the stud in the depth of field ring near the base of the camera). On pressing the release button with the lever set to "V", the shutter goes off after a delay of approximately 10 sec., giving the operator time to take his place in the picture. Once the lever has been set to "V", the position cannot be altered any more. On releasing, the lever will automatically move back to the X position. FLASH SETTINGS. For X- or M-synchronization, set the lever at the right of the shutter (on the lower part of the shutter on earlier Reflex models) to X or M, at the same time depressing the small protruding lock, as for the self-timer setting. The Retina Reflex IV, III and S lenses are interchangeable, being held in place by quick-change bayonet fitting. The shutter is situated behind the lens, and any lens inserted can be accurately focused by both the split-image rangefinder and the ground glass focusing screen. As the taking lens is at the same time the finder lens, you always see the correct view in the finder with any lens used. The iris diaphragm of all lenses couples up automatically with the aperture-speed controls on the shutter, and with the pre-selector mechanism that stops down the lens on releasing the shutter. The 1 1/8 in. (28 mm.) Retina Curtagon f4 covers an angle of 76° as compared with the standard lens of 47°, and is an ultra-wide angle lens. The 1 1/8 in. (30 mm.) Retina Eurygon f2.8 has a slightly smaller angle of view than the 28 mm. lens, but is intended for the same applications. The 1 3/8 in. (35 mm.) Retina Curtagon f2.8 and Retina Eurygon f4 cover an angle of 64° and are normal wide-angle lenses. The focusing range of the wide-angle lenses extends from infinity down to 3 ft. The 28 mm. and 30 mm. lenses take 60 mm. filters; no lens hood is required, the lens being sufficiently recessed in the mount. The 35 mm. lens takes 32 mm. filters and a special rectangular bayonet lens hood. The 3 3/8 in. (85 mm.) Retina Tele-Arton and Retina Rotelar f4 cover an angle of 28° as compared with the standard lens of 47°. The focusing range of the 85 mm. lenses extends from infinity to 6 ft. The 5 3/8 in. (135 mm.) Retina Tele-Xenar and Retina Rotelar f4 cover an angle of 19°. The focusing range of the 135 mm. lenses extends from infinity to 14 ft. For close-ups with this lens, see below. The 7 7/8 in. (200 mm.) Tele-Xenar focuses from infinity to 25 ft. and covers an angle of 12°. The 85 mm. lens accepts 32 mm. filters and uses the rectangular bayonet hood (as used for the 35 mm. lens) with a supplementary attachment. The 135 mm. lens accepts 60 mm. filters and uses a round slip-on lens hood. Above: The interchangeable lenses greatly increase the versatility of the Retina Reflex cameras. The wide-angle lens (top left and centre) covers a large angle of view as compared with the standard lens (bottom left). The tele lenses on the other hand include a much narrower angle and show distant subjects larger (right). To remove the lens of the Retina III or S press the catch below the lens barrel, and turn the milled lens mounting ring anti-clockwise to lift out the lens. To insert an alternative lens, place it in position with the red dot on the lens opposite the red dot on the camera mount. Then turn clockwise to let the bayonet catch engage. To remove the lens of the Reflex III and S, depress the lens lock underneath the lens barrel and at the same time turn the lens fully anti-clockwise. Then lift out. To insert a lens, place it in position with the red dot on the lens mount against a similar red dot on the bayonet ring of the shutter. Now turn the lens clockwise until the catch engages. After changing the standard lens against the wide-angle or telephoto units, the image is focused on either the ground glass screen or with the split-image rangefinder in the same way as with the standard lens. At the same time, the reflex screen shows the exact field of view of the particular lens used. There is no parallax error nor are any supplementary viewfinders required. The tele and wide-angle lenses for the Retina Reflex IV, III and S have their own depth of field indicator pointers which show directly the extent of the sharp zone at all settings. The 135 mm. lenses can also focus on distances nearer than 14 ft. For this purpose a TII/60 supplementary is used for close-ups between about 13 and 7 ft., and a TI/60 lens for distances between 6� and 4� ft. A TI/32 supplementary lens in the same way covers near distances from 6 to 3� ft. with the 85 mm. tele lenses. The earlier Retina Reflex has a convertible lens system with an interchangeable front component which can be replaced by various alternative front components for different focal lengths. If the Retina Reflex is equipped with the standard Xenon C lens, only the 1 3/8 in. (35 mm.) Curtar-Xenon f4 or f5.6 can be used as wide-angle unit. If the camera has a standard Heligon C lens, only the 1 3/8 in. (35 mm.) Heligon C f4 or f5.6 can be fitted. These 35mm. lenses increase the angle of view to 64� compared with the 47� of the standard lens. The 35 mm. f5.6 lenses accept 32 mm. filters and the standard lens hood with supplementary rectangular bayonet attachment. The 35 mm. f4 lenses take 60 mm. filters and a round 60 mm. slip-on lens hood. If the Retina Reflex is equipped with the Xenon C as the standard lens, only the 3 1/8 in. (80 mm.) Longar Xenon C f4 can be used as telephoto unit. Cameras with a Heligon C standard lens take the 3 1/8 in. (80 mm.) Heligon C f4. These 80 mm. lenses decrease the angle of view to 30� as compared with the 47� of the standard lens. They are fully corrected. The 80 mm. lenses take 60 mm. filters. The lens hood required forms part of the plastic container in which the lens is supplied. To remove the interchangeable front component of the standard Retina Reflex lens, press the safety catch inwards (towards the lens) and turn the front part of the lens in an anti-clockwise direction as far as it will go, that is, until its red dot is opposite the red dot on the black outer rim of the lens mount. The lens can now be lifted out. For easy removal and safe storage of the standard lens, the special container available for it should be used. . .
To insert an alternative lens unit into the camera, place it in position over the mount so that the red dot on the lens lies opposite to the red dot on the shutter rim. When the lens is seated, turn it firmly in a clockwise direction as far as it will go to engage the bayonet lock. A slight click is usually audible. The standard lens of the Retina Reflex must not be changed against a standard lens from another Retina Reflex or from a Retina IIC or IIIC camera. Therefore, make sure that the serial number engraved on the lens itself is the same as the serial number engraved on the bayonet mount front plate of the camera. To change the lenses of the original Retina Reflex remove the front component by pressing the catch inwards and turn the lens anticlockwise (left), then lift out (centre). When inserting a lens line up the red dot on the lens component with the red dot on the front of the shutter. then turn clockwise to engage the bayonet lock. Above: With the wide-angle lens (left) the zone focus setting is marked by a small black circle. Set this circle to the red triangular index mark. The black scale now indicates about 20 ft. Set the distance scale to 20 ft. and the aperture to f11. This yields a sharp zone of focus from about 5� ft. to infinity. The telephoto lens (right) has two small black circles. For near focusing, set the circle near figure 15 to the red triangle. The black scale then indicates 6 ft. Set the distance scale to 6 ft. and the aperture to f11, and the zone of sharp focus extends from about 11� ft. to 20 ft. For far focusing, set the black circle near figure 50 to the red triangle. The black scale will then indicate 20 ft. Set this figure on the distance scale and the aperture to f11, and the zone of sharp focus extends from 25 ft. to infinity. After changing the standard lens against the wide-angle or telephoto lens units, the image is focused on either the ground glass screen or with the split image rangefinder in the same way as with the standard lens. At the same time, the reflex screen shows the exact field of view of the particular lens used. There is no parallax error nor are any supplementary viewfinders required. To ascertain the depth of field obtained with either telephoto or wide-angle lens, focus the Retina Reflex with the rangefinder or reflex screen. Read off the distance setting on the distance scale opposite the elongated diamond mark. Then set this figure on the black scale of the telephoto or wide-angle unit against the red triangular mark. The extent of depth of field can now be read off to the right and left of this triangular mark on the white scale of the lens (see also below). ZONE FOCUSING WITH C LENSES. The zone focus setting on the wide-angle lens is marked by a black circle near the 10 ft. position on the lens scale, marked "35 mm." in red. Set this circle to the red triangular mark on the adjacent scale. The triangle lined up with the circle points to the black distance scale of this lens to 20 ft., thus indicating that the distance on the camera focusing scale should be set to 20 ft. to obtain a depth of field from 5� ft. to infinity at f11. The telephoto unit carries two zone focus settings each marked by a black circle, one near the 50 ft. figure (far zone setting) and the other one near the 15 ft. figure (near zone setting) on the distance scale marked "80 mm." in red. For far zone focus setting, line up the circle near the 50 ft. mark with the red triangular mark on the adjacent scale and they will point to 20 ft. on the black scale. Set camera distance to 20 ft., and at f11 a depth of field from about 25 ft. to infinity is obtained. For near focusing use the black circle near the 15 ft. mark and align with the red triangle. When properly aligned they will point to 6 ft. on the black distance scale. At an aperture of f11 a depth of field from approximately 11� to 20 ft. is obtained. The scale rings on both the telephoto and wide-angle units are solely calculating rings for depth of field and zone focus setting. They have no other function; in particular, they are not used for distance setting. The telephoto lens covers distances between 6� ft. and infinity. Closer distances, between 3� and 6� ft., can be taken with the aid of the TI/60 close-up lens. This will be found particularly useful for close-up portraits to avoid distortion. The correct distance setting as well as the accurate field covered is -- as in all other cases -- observed through the reflex finder. To determine the depth of field available, focus on the subject in the normal way. Read off the distance setting and set the equivalent figure on the black scale of the lens to the red triangular mark. Now read off the extent of depth of field to the left and right of the red triangle on the yellow scale. With the interchangeable lens units you use the same exposure value settings of the exposure meter as with the standard lens. Watch that you do not use lower aperture values (larger apertures) than the maximum aperture of the lens unit employed. With the f4 telephoto and wide-angle lens units, the aperture on the camera must not be used wider open than f4, and the alternative f5.6 wide-angle lens unit must not be used with the aperture on the camera wider than f5.6. While the Retina Reflex normally focuses down to 3 ft. (90 cm. ), one can work at still shorter distances with the aid of the Retina supplementary lenses. Separate lens diameters are available for f2.8 (f2 on earlier Retina Reflex) and f1.9 lenses. Two different lenses are available. The Retina Supplementary Lens N1 (featuring mark: one ring around the circumference) for distances between 38� and 18 in. (90 to 46 cm.) covering a subject field from 17�x26� in. to 8�x12� in. (45 x 68.5cm.to 21.5x32.5 cm.). The Retina Supplementary Lens N2 (featuring mark : two rings around the circumference) for distances between 20 and 12 in. (50 to 30 cm.) covering a subject field from 8�x12� in. to 4 1/8 x 6 1/8 in. (21.5x32.5 cm. to 10.5x 15.5cm.). N1 and N2 lenses can be used together (by screwing them into each other) for distances between 14 7/8 and 12 in. (37.5 to 30 cm.) covering a field from 5 3/4 x8 5/8 in. to 4 1/8 x 6 1/8 in. (14.5x22 cm. to l0.5x15.5 cm.). For ultra close-ups three two-element colour corrected, coated, supplementary R lenses, mounted in metal screw-in mounts, are designed for photographs at four fixed distances between 11 and 6 in. The R lenses are only available for use with f2.8 lens of the Retina Reflex III and S. They also fit the f2 lens of earlier Retina Reflex models. Lens R1:4.5 gives an approximate scale of reproduction of 1:4.5 covering a field of 4� x 6 in. (11 x 15.5 cm.). Lens R1:3 gives an approximate scale of reproduction of 1:3 covering a field of 2 3/4 x 4 1/8 in. (7 x 10.5 cm.). Lens R1:2 gives an approximate scale of reproduction of 1:2 covering a field of 1 7/8 x 2 3/4 in. (4.75 x 7 cm.). Lens R1:4.5 combined with lens R1:2 gives an approximate scale of reproduction of 1:1.5, covering a field of 1 3/8 x 2 in. (3.5x5 cm.). Close-up lenses screw over the standard lens. The reflex ground glass screen of the camera shows the exact image covered free from parallax, and the picture can be focused in the same way as without a close-up lens. At full aperture the definition falls off slightly, especially towards the corners, and the camera lens should be stopped down to about f5.6 in the case of the N lenses and to f8 when using the R close-up lenses to regain full edge definition. No change of exposure time is required. The depth of field when working at close range with the supplementary lenses is obviously rather limited. The table on p.68 gives the extent of the depth to be expected for close-up work. The NI supplementary lens allows focusing between 38� in. and 17� in. and at these distances the field covered is 26 3/8 x 17 1/2 in. and 11� x 7� in. respectively. The N2 lens allows focusing between 20 in and 13 3/8 in. and again at these distances covers a field of 12� x 8� in. and 7+ )( 41 in. respectively. Mounted together. even closer distances can be focused, from 14 7/8 in. to 11 5/8 in. Here the field covered is 8 5/8 x 5 3/4 in. and 5 3/4 x 3 7/8 in. respectively. For ultra close-up work three supplementary R lenses are available (not available for f1.9 lenses). RI:4.5 gives an approximate scale of reproduction of 1:4.5 and covers a field of 6x4� in. RI:3 gives an approximate scale of reproduction of 1:3 and covers a field of 4 1/8 x2 3/4 in. RI:2 gives an approximate scale of reproduction of 1:2 and covers a field of 2 3/4 x 1 7/8 in. RI:4.5 combined with RI:2 gives an approximate scale of reproduction of 1:1.5 and covers a field of 2 x 1 3/8 in. Left: The Retina copying outfit consists of a camera holder with extendible legs and incorporates its own lighting unit. It is used with the N2 supplementary lens and covers two field sizes. Right: The micro-adaptor enables the Retina Reflex to be used with most microscopes. Extreme right: The close-up attachment is a simplified version of the combination of table stand and field frames. Extreme left: The Retina table stand used with the N supplementary lenses and (left) the stand in use with R lenses and a frame holder taking close-up field frames. Right: The stereo attachment for the original Retina Reflex only. An optical system produces two upright pictures side by side with the correct stereo separation. When working with the ultra-close R lenses the reflex screen will, of course, permit parallax-free focusing. Nevertheless, for close-ups of live subjects the use of the Retina close-up attachment is recommended. It consists of a camera platform which takes four alternative sets of legs which act as a distance gauge and show the correct field area covered at the same time. To use it, screw the R lens required to the camera lens and clamp the corresponding set of two legs into the appropriately marked notches of the attachment. Then approach the subject until it is in the plane of the gauge rods fixed into the front ends of the legs. The table stand has been developed for close-up subjects which allow or need longer exposure times as well as for all types of close-ups where quick setting-up and absolute steadiness of the camera is important. The stand consists of a U-shaped base with an adjustable column and a ball and socket head. The latest version has, in addition, a baseplate to support the camera in its centre. The stand can be taken apart into its individual components for easy transport and storage. It is specially useful for close-ups with the N close-up lenses. Alternatively, the ultra close-up lens set R1:2, R1:3 and R1:4.5 can be used with the table stand in conjunction with a frame holder and close-up field frames showing the correct distance and field with these R lenses. This ultra-close-up attachment for the table stand is, however, no longer in production. For quick and convenient copying of documents, important letters, valuable prints, book pages and the like from about 6 x 8 in. to 8 x 12 in. in size a special copying stand has been designed. The outfit consists of a camera holder which takes four extendible legs. The bottom ends of the legs are fixed into the four corners of a glass plate which is laid on top of the document or other matter to be copied. The table stand is used with the Retina Reflex Iii and S models for close-ups in natural size. To assemble the stand, the main collar (2) with the legs fits into the camera (1) in place of the lens (3). The latter. with an R1:2 close-up lens (4) and the lens hood (5), goes into the extension collar. The base plate (6), extended to the ends of the legs, acts as a distance gauge and outlines the field taken in. In use, the close-up stand with the camera is simply placed on top of the subject to be copied. The plane of sharpest focus is the underside of the base plate. For copying colour slides on black-and-white film, a slide holder attachment screws into the bottom of the base plate (lower left) and holds the slide in position. The diffusing screen belonging to the slide holder illuminates the transparency from behind when pointed at a suitable light source. The right-angle finder attachment (left) fits over the eyepiece of the Retina Reflex and Reflex S Models (a special adaptor is required for the Reflex III) for a waist-level view of the image (e.g., when shooting round corners) or for a horizontal view when the camera Is pointing downwards. The frame finder model S (right) is useful for sports photography. Swing-in frames outline the reduced field of view 85 mm. and 135 mm. lenses. This permits same-size reproductions with the Retina Reflex III and S with f2.8 lens. It is used in conjunction with the R1:2 close-up lens. This stand permits easy reproduction of things like postage stamps, jewellery, small mechanical parts, etc., of little thickness. It will also be found useful for copying colour transparencies. For this purpose a slide holder with diffusing screen is available. The stand consists of a baseplate with a 24x36 mm. opening, and an extension tube ring with legs. The latter hold the camera system at the right distance from the subject plane. To set up the stand, loosen the black thumb-screw connecting the baseplate to the body. Move the baseplate until the ends of the legs are flush with the baseplate. Tighten the thumb-screw again. Attach the stand to the camera in place of the lens. Screw the R1:2 lens into camera lens and clip on the lens hood. Mount the camera lens on table stand. Place the camera with the table stand on top of the subject. Stop down to f22 to obtain maximum depth of field. A slide holder with diffusing screen can be screwed to the baseplate to hold colour transparencies in a spring clip. For making photographic records in black-and-white or colour of microscope investigations, the Retina Reflex micro-adaptor is useful and simple to handle. The micro-adaptor allows the Retina Reflex camera (but not with f1.9 Xenon or Heligon) to be used with any microscope with a standard eyepiece diameter of 25 mm. The attachment consists of a light metal body with a focusing eyepiece at the front and an arm to hold the camera at the back. To make photomicrographs with the Retina Reflex, remove the microscope eyepiece, connect the microscope tube to the micro-attachment, and re-insert the eyepiece. Mount the Retina Reflex on the camera bracket. Focus through the focusing eyepiece of the attachment using the coarse and fine adjustment of the microscope. The focusing scale of the camera must be set to infinity and the lens to its largest aperture. Stereoscopic photographs may be taken with the Retina Reflex camera by taking two pictures, one immediately after the other. For this purpose parallelogram or sliding base attachments are available each giving the correct separation of 64 mm. Both types of attachment must be used in conjunction with a tripod and are only suitable when the subject photographed is stationary. A more convenient method of taking stereoscopic photographs with the Retina Reflex (not Reflex IV or S) is, however, to use the stereo attachment. This consists of an optical system which produces two upright pictures side by side each measuring 16 x 22 mm. The prisms are so arranged that the two pictures are taken with the correct separation of 64 mm. which corresponds with the average separation between human eyes. To use the stereo attachment, fit it over the standard lens by lining up the red dot on the rear of the attachment with the red dot on the camera lens. The attachment is then turned clockwise into a horizontal position to engage. The ground glass reflex image shows the correct double image and permits focusing in the usual way. Stereoscopic pictures can be taken at distances from 6 ft. to infinity. Exposure times are unchanged for apertures of f5.6 and smaller with the stereo attachment. For wider apertures double the exposure indicated by the meter by reducing the light value by 1. RIGHT-ANGLE FINDER. To tackle low angle views, subjects near the ground and copying, a right-angle viewfinder has been designed for the Retina Reflex (not for III). It fits over the viewfinder eyepiece and is held in position by a bayonet lock. FRAME FINDER MODELS. A folding frame finder is available for the Retina Reflex. This fits into the accessory shoe of the camera and is intended for shooting fast-moving subjects, architectural studies or any shot where it is desirable to be able to see the field of view immediately outside that of the viewfinder. Its frame gives the correct field of view for the standard lens and masking devices can be swung into position to cover the field of the telephoto lenses. Parallax adjustment for close-range work is provided. This section gives the more important data for Retina Reflex films, lenses, exposure, etc., in handy tabular form for easy reference. Many cameras are marked only in either the metric or English and American system, while most of the tables in this book are also given only in one system. The table below shows at a glance equivalent lengths. *The original Retina reflex has a black circle near these distances to indicate useful focusing zones. In bright rooms (kitchen, bathroom) or with films faster than 100 ASA use next smaller aperture. In very large rooms, at night outdoors or with 40-64 ASA films use next larger aperture. The Focal Flash Chart gives exposure for all types of flash as well as for flash combined with daylight. It further contains a list of all flash bulbs with their use and performance, also information on "colour and flash" and much additional flash data. For 40-50 ASA films use two stops smaller (e.g., f16 instead of f8). The above film speeds are based on the latest ASA Standard, giving the minimum correct exposure to make the most of the films' versatility and image quality. Some manufacturers, however, still quote their speeds from the older system which gives a more generous exposure. This accounts for any disparity between these tables and the manufacturers figures.